FILE - Dozens of Turkish F-16 jets prepare to take off during Anatolian Eagle exercise at 3rd Main Jet Air Base near the central Anatolian city of Konya. Turkey said it has carried out airstrikes on Islamic State targets in Syria, in a significant escalation of its involvement in the battle against the extremist group. 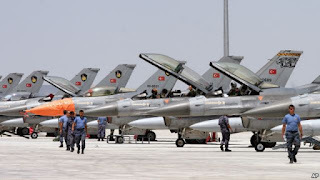 Three F-16s took off from Diyarbakir in southeast Turkey early Friday and struck targets across the Turkish border province of Kilis, according to the prime minister's office. The statement said the jets dropped four guided bombs on a pair of Islamic State headquarters and a meeting point before returning safely to their base. Speaking at a news conference, Prime Minister Davutoglu vowed that his government will not ignore attacks on Turkey. "As of this morning, the Turkish armed forces have, based on instructions received from the government, shot pinpoint targets with 100 percent accuracy. Those targets have been destroyed," Davutoglu said. "Our message is quite clear: I have given full authority to the Turkish armed forces that whoever causes any threat to the borders of the Republic of Turkey will be responded to accordingly without any further notice," he added. It is the first time Turkey has launched airstrikes against Islamic State targets in Syria. Also Friday, Turkish officials said 251 people were detained during a massive dawn police raid on Islamic State and Kurdish militant locations across the country. More than 5,000 officers, backed by helicopters, raided at least 100 locations across Istanbul in search of the militants, according to media reports. The operations come after Turkey reportedly agreed this week to let U.S. fighter planes use Incirlik Air Base in southern Turkey to launch attacks on Islamic State militants inside Syria. Neither Turkey nor the U.S. has publicly confirmed the deal. But reports in several media outlets said the agreement was finalized during a phone call Wednesday between Turkish President Recep Tayyip Erdogan and U.S. President Barack Obama. The U.S. military has long operated at the Incirlik base, but Turkey has rejected repeated requests by Washington to use the base for attacks against the Islamic State group. The air base is about 400 kilometers (250 miles) from Raqqa, the Islamic State stronghold in Syria, and would sharply cut the length of the 1,900-kilometer (1,200-mile) bombing runs the U.S. has been carrying out from Iraq into Syria. The U.S.-led coalition has launched thousands of bombing runs on Islamic State positions in Syria and Iraq and said it has had some success in halting the militants' advance. But the Islamic State group still controls wide swaths of northern and western Iraq and northern Syria just across the border from Turkey. 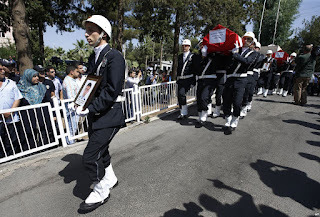 Turkish police officers carry the coffins of police officers Feyyaz Yumusak and Okan Acar, during a funeral procession in Sanliurfa, southeastern Turkey, July 23, 2015. In recent weeks Turkey has seen itself drawn into more cross-border clashes. On Thursday, Islamic State fighters in Syria and the Turkish military engaged in a skirmish that left at least one Turkish officer dead. A devastating bombing in Suruc, Turkey, Monday killed 32 people, mostly young activists preparing for an aid mission to Syria. The Turkish government for the first time blamed the Islamic State group for the assault. Two days later, two Turkish police were shot dead near the Syrian border. The Kurdistan Worker's Party, or PKK, claimed the attack, saying it was retaliation for the Turkish government colluding with the Islamic State group.